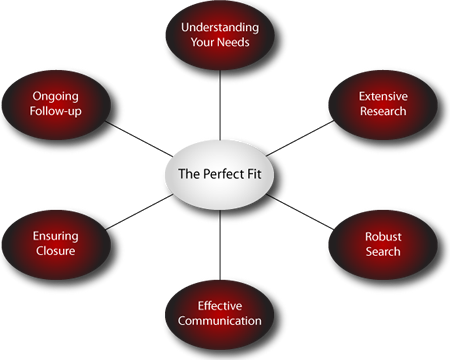 Our methodology has been proven to effectively and efficiently find our clients the perfect fit. The diagram to the right visually demonstrates how all of the steps that we use are ongoing throughout a successful search. We never stop researching, searching, communicating, understanding our client, and strategizing until we find our client that ever-sought after perfect fit.